Catania After a great farewell on Friday night from my new friends (I better warn my family that I’ve invited them all to New Orleans – and they’re coming!) and colleagues with La Citta in Paterno (sausage pizza and a dessert that was chocolate cake from heaven! 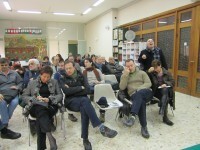 ), only hours later it was full steam ahead to make a presentation in Catania, the 2nd largest city in Sicily, about how community organizing strategies could build active citizenship. Who knows if the topic had been carefully considered or pulled out of the air, but after a week of immersion in civic movements from all around Sicily in Palermo and with La Citta and others in Paterno, the comparisons between these “civic movements” and “community organizations,” was much on my mind. A question about lessons one could learn that Laura la Manna with another emerging civic movement had asked me in Paterno was also much on my mind. This all seemed appropriate since if Sicily is at the heart of the civic movement phenomena in Italy, in some ways Catania has been at the heart of civic movements in Sicily. In fact we were meeting at Santi Pietro e Paolo, a uniquely progressive Catholic church which had been at the center of the civic movement Cittainsieme in Catania, which means “city together.” It was an honor to be in this crowd of 50 on a Saturday morning. Walking around introducing myself, it seemed that virtually everyone there had earned their stripes in one major movement or campaign after another whether saving the Port itself or making sure the water was both clean and not privatized or pushing for bike lanes or more seriously facing down corruption and organized crime. I was humbled to be introduced by the fiery, progressive priest who had been a sparkplug behind many efforts and supporter of all of them, Salvatore Resca. I absolutely invited him to move to New Orleans where we needed a priest in the city again to really shake up the church and put it once again on a progressive path. He agreed, but I’m afraid he didn’t really mean it! I offered the simple lessons and rules I could share about mistakes NOT to make from 40 years of organizing (things like, “when it comes to money, the most important thing is to ask!”), but as always what was most interesting were the amazing questions. The first had to do with a powerful movement that had risen – and won! – in Syracuse not far away and was now struggling with how to maintain its autonomy after having so quickly won a change of government in that city. I wish I had had time to visit there and see this first hand. There were other questions about how to integrate values with issues in building organization, which couldn’t have been timelier if asked in any community meeting in the United States. A long question followed up later afterwards revealed an interest in organizing a living wage movement in Italy and Europe as a whole! A bright, young community organizer asked questions that ranged from how I ended up in this work to how to fund organizing (see above!). Perhaps most moving was a side discussion provoked by a question about ACORN’s experience in voter registration over the years and the firestorm that activity provoked in 2008 and the consequences of the rightwing attack that shattered the organization in the USA by the end of 2010. The perspectives of these movement veterans were mature and wise. They knew battles and had scars from both victories and defeats. Several rose to argue to me that this was just part of the process, and we needed to simply build even stronger in the future. They know how victory and defeat tastes here in Sicily, and have learned something about resilience in their commitments and organizing. What a wonderful session for me! I wish I could have made more of a contribution to all of them! Maybe in a small way I did. At the end of my remarks, Paolo Guarnaccia suddenly wanted to say one last thing after I had thanked everyone. He wanted to “pass the hat” and ask for anyone who wanted to make a contribution to continue the effort to build civic movements and community organizations. Later in surprise he shared with me that he had never done so before in his life, and in shock reported to me that almost 100 euros had been gladly pitched in to support the work. That one small lesson leaned might move mountains and create many movements and organizations in the future! Perhaps I had done my work here after all? Ps. Yikes, I invited all of the group in Catania to visit New Orleans as well, so here comes Sicilia!